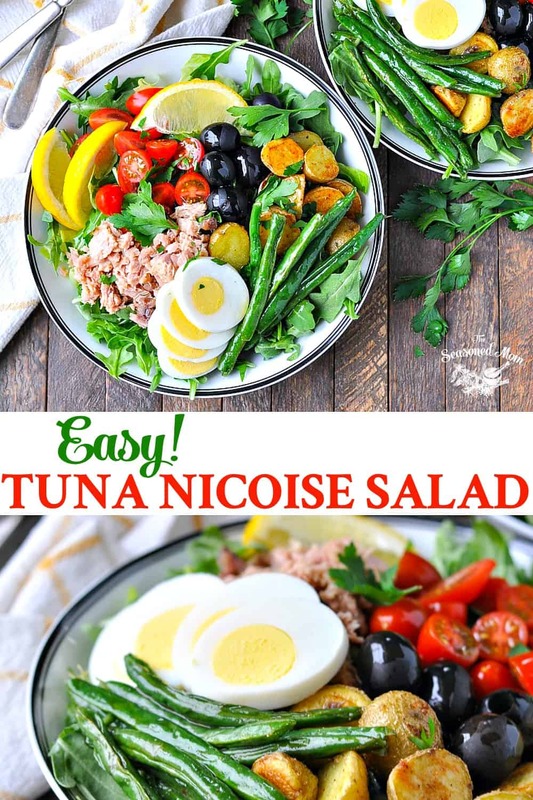 The perfect combination of flavorful ingredients this classic tuna Nicoise salad is perfect for a simple and quick lunch or dinner. 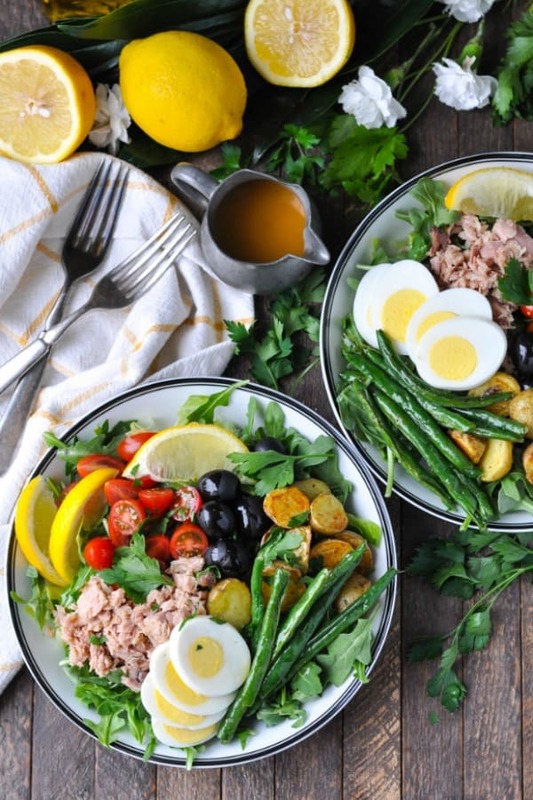 The perfect combination of flavorful ingredients, this classic Tuna Nicoise Salad is a simple, fresh, and easy lunch or dinner option for the sunny months ahead. 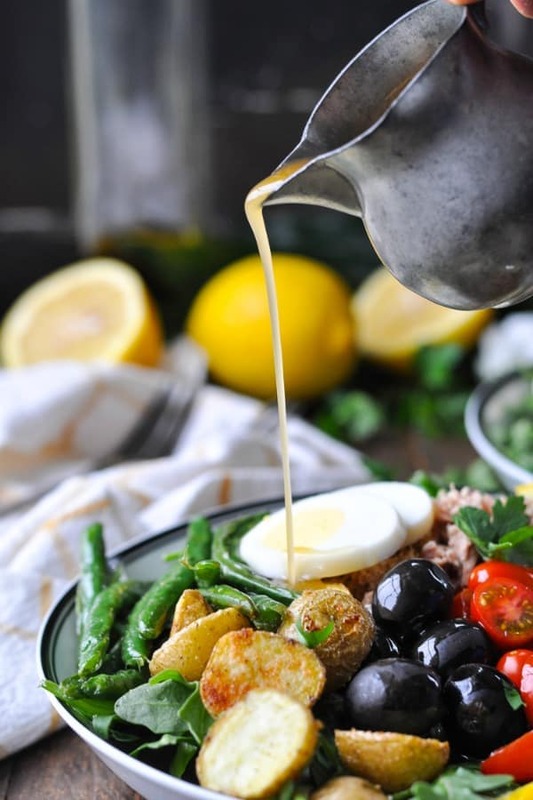 With warm, crispy roasted potatoes and green beans, tuna, olives, and more, it’s a healthy meal that truly satisfies! Food is so much more than taste or “fuel,” isn’t it? 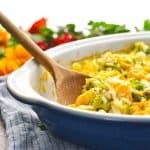 What I love most about cooking is the ability to instantly conjure fond memories, moments in time, or positive associations — simply by stirring together a few ingredients, catching a whiff of a dessert baking in the oven, or even just glancing at an old, stained, handwritten recipe card. Cooking is also a way to show our loved ones that we care. The meals don’t have to be fancy, time consuming, or expensive. Instead, the mere thought and process involved in nourishing our family says so much more than words. My mom is a wonderful home cook, and made just about every dinner for us at home when we were growing up. 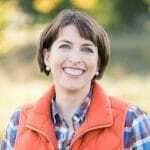 There are certain recipes that instantly transport me back to my mom’s kitchen, including her spaghetti with meat sauce, apple pie, flank steak, crab dip, and marinated cucumbers. And this Nicoise Salad! If I ever see a Tuna Nicoise Salad on a restaurant menu, I always think of Mom. We rarely ate salads as entrees when I was growing up — largely because my dad and brother probably would have looked at my mom and instantly asked where the “real” food was! 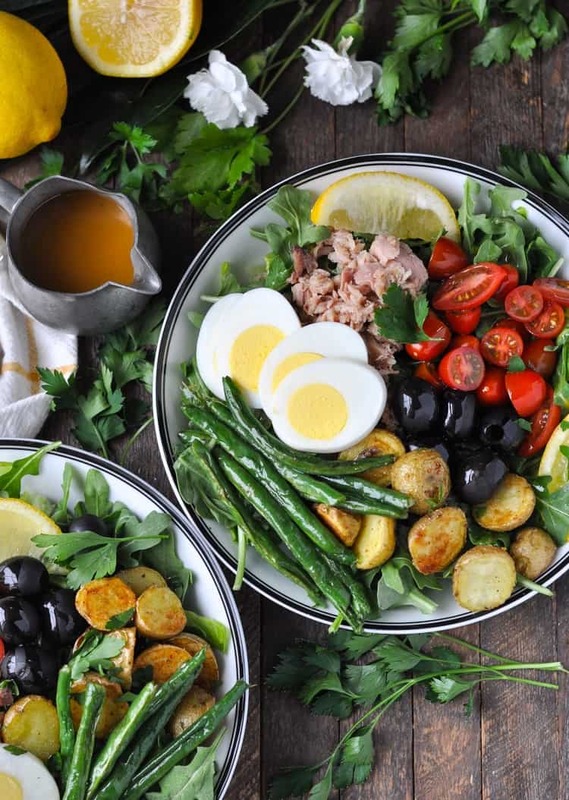 A Nicoise Salad was an exception to that rule, though, because it’s so filling and satisfying (even for men with big appetites)! While a quick glance at the recipe makes it seem as though there are a lot of ingredients and a lot of steps required to prepare this salad, let me assure you: it is SO easy (and quick)! 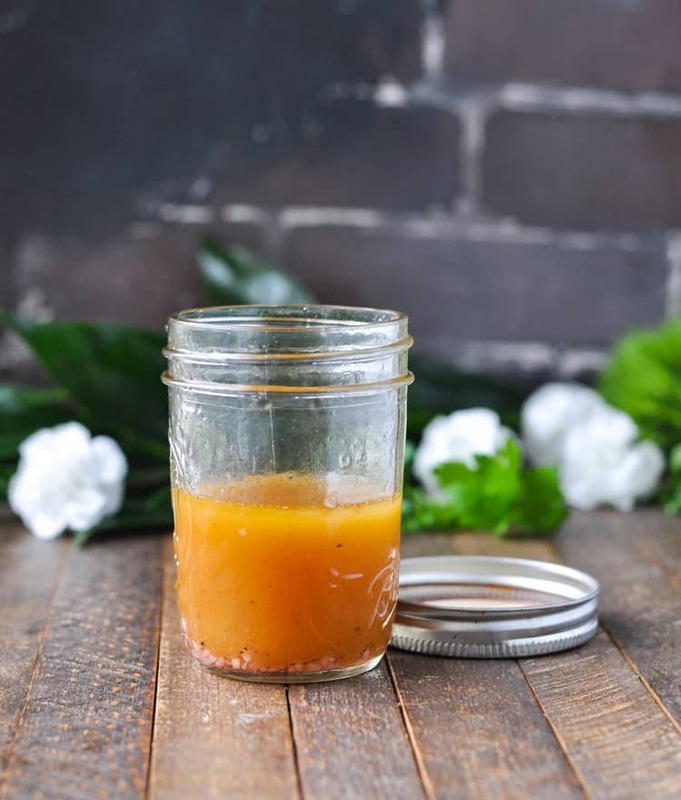 You can have the whole thing tossed together in about 30 minutes — including warm, crispy roasted potatoes and green beans, as well as this simple homemade red wine vinaigrette. A salad with so many delicious toppings doesn’t need anything more than the most basic olive oil dressing, and this particular version perfectly highlights the variety of flavors in the ingredients. 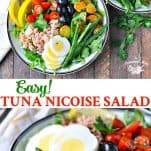 The Tuna Nicoise Salad is a classic that has been a favorite in our family since my grandmother first started serving it, and I’m proud to say that I’m carrying on the tradition! I hope that you all love it, too! Preheat oven to 400°F (200°C). 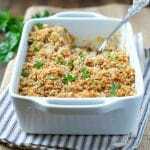 Line a large rimmed baking sheet with cooking spray and set aside. Place potatoes in a large zip top plastic bag. 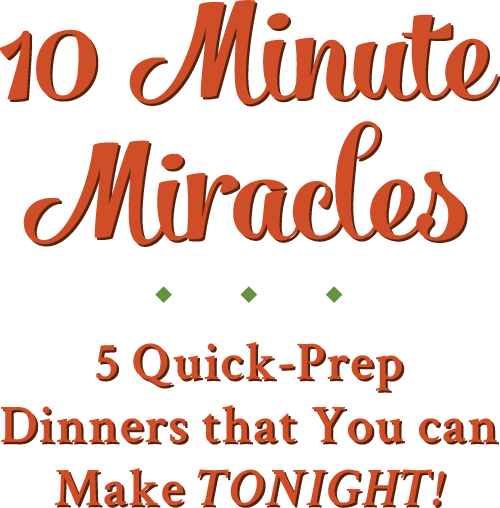 Add 1 tablespoon of olive oil, ¼ teaspoon garlic powder, and ¼ teaspoon salt. Toss gently to coat all of the potatoes evenly with the oil and seasonings. Spread potatoes onto prepared baking sheet (save the plastic bag so that you can use it again with the green beans). Roast the potatoes in the oven for 15 minutes, stirring once. While the potatoes are in the oven, place the green beans in the large zip top plastic bag. Add 1 tablespoon of olive oil to the bag, along with ¼ teaspoon salt. Toss gently to coat the green beans in the oil and salt. After the potatoes have been roasting for 15 minutes, remove the baking sheet from the oven. Spread the green beans onto the baking sheet with the potatoes in a single layer. Return the baking sheet to the oven and roast potatoes and green beans for about 10-15 more minutes (stirring halfway through), or until vegetables are tender. Keep an eye on the potatoes, because very small potatoes will be done in about 20 total minutes, while larger potatoes will need closer to 30 minutes. They should be crispy on the outside and soft on the inside. Divide lettuce greens evenly among serving bowls. 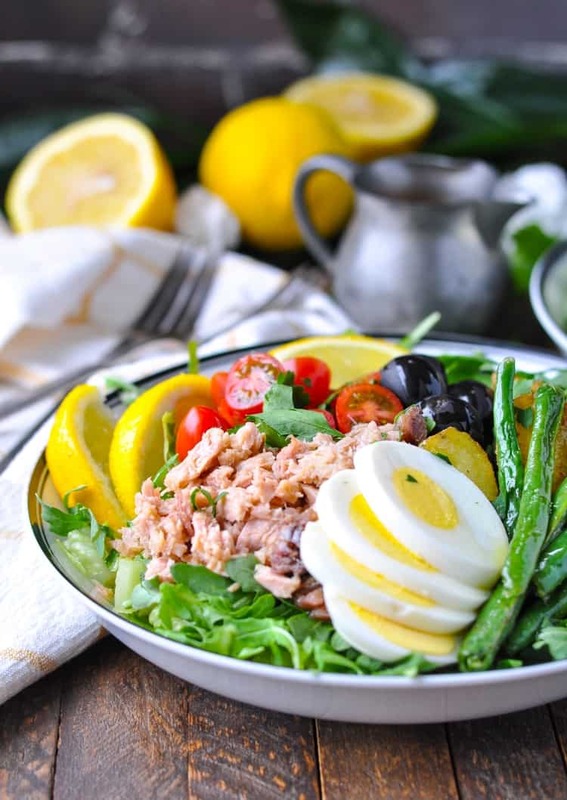 Top each bowl of lettuce with tomatoes, hard-boiled eggs, olives, anchovies, tuna, roasted potatoes and green beans. 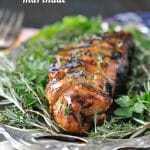 Drizzle with vinaigrette and garnish with fresh parsley. Cooking Just for Two? Cut the ingredients in half and only prepare two salads. Yummm! 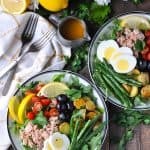 I love Niçoise salads – such a simple and delicious classic! 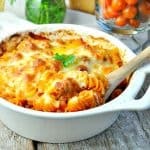 I wish I could just reach in and grab that bowl from my screen, drooling! I love this light and fresh meal, Emily! Thank you! Beautiful pictures! Outstanding! Award worthy! Someone must tell you this. AND about the salad, amazing such a lovely meal can be made with ingredients we have on hand. Great healthy fare . . . Really can’t say enough about the Nicoise salad. Thank you Blair!